This winter, Mall of America® will bring a one-of-a-kind experience to visitors from around the world. Ice Castles, LLC, will build its largest structure ever, a castle that will stand more than 40 feet tall at its peak and span more than one acre. It all starts with an icicle. 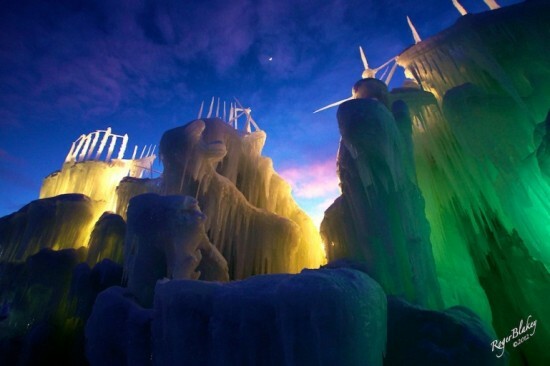 Unlike typical ice structures that are built with ice blocks, the Ice Castle is made of icicles organically grown from 4 million gallons of water and then fused together. The castle will join 50 large ice towers together to create a series of shimmering archways, tunnels, walls and caverns. In the center courtyard looms the largest frozen tower, reaching more than 40 feet high. Latticed icicles connect the icy columns to the tower, creating roomy caverns. Inside the Ice Castle, there will be several “Throne Rooms” with an ice chair large enough to seat several people. At night, the castle will take on a magical look as thousands of LED multi-colored lights illuminate the ice from within. Even after opening, the castle continues to be “grown” because ice melts and evaporates. This continuous evolvement keeps the castle looking fresh and exciting. It is estimated that throughout its run at Mall of America, more than one million icicles will have been used in the castle’s creation and maintenance. Beyond the castle itself, there will also be a children’s snow park area with a snow pile that is 40 feet in diameter and 4 feet tall. This is a great place for kids to play and even make snowmen. Warm drinks and food will also be available for purchase. The attraction, constructed over the course of four to six weeks during the holiday season, plans to open in late December and stay open through the end of February 2013, weather permitting. The Ice Castle will be open from noon to 10 p.m. Monday through Friday, 11 a.m. to 10 p.m. Saturday, 1 p.m. to 7 p.m. Sunday. Guests can purchase tickets at the guest service desks at the four main entrances to the Mall beginning Thursday, Oct. 25. Tickets can be purchased on-site at the castle starting the day that it opens. Adult tickets will be $10 and children ages 3 – 12 will be $5. A family four pack can be purchased for $25 with add-on’s to the family pack at $4 with a limit of three.